On the Swedish market for many years Gremo has been in the lead in the 8-10 tonnes load category. The key to success you find at Ätran, Falkenberg community. What we deal with belongs to the most precious assets in this world, forst and people. 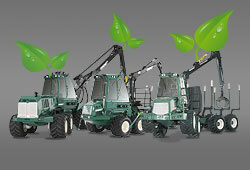 Our challenge is to make you feel comfortable with our machines, but also to develop, manufacture and sell forest machines causing as little damage as possible in the forest without renouncing efficiency and performance We are a bit on the way. Not less than 95% of our customers buy a Gremo machine again. If you are not one of them, maybe you have missed something? Gremo AB has to be associated with environmental thinking owing to that environmental issues in an obvious way are integrated in the daily work from the design to the marketing of our forestry machines. Gremo´s environmental work must be known by customers, service people and suppliers for our ever prevailing endeavour to prevent negative effects on the environment. We consider legal provisions as minimum demands, which also applies to future legislation. Gremo obliges itself to prevent pollution and work for continuous improvement. Gremo´s history dates back to the early sixties, when a Danish entrepreneur founded the company at Fredrikshamn, Denmark. The name of the company originated from the combination of the wife´s name Grete and the name of his littlre brother Mogens. 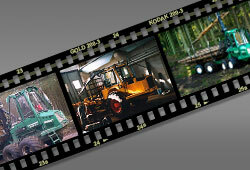 Originally manufacture comprised dumper carts and forest trailers for tractors. With the aim to further develop the company the Swedish production facilities of forestry machines, TimmerVille at Huskvarna were acquired. The TimmerVille construction was based on a Ford tractor chassis and was in fact a waist operated wheel-driven forwarder. After a number of modifications the machine was manufactured and sold under the name of Gremo TT-12. A couple of years after came the introduction of the TT-8, a smaller agile thinning forwarder and a strong alternative to RK-66 Snorre and Mini 578. Not too many machines were exported to Sweden, but in Germany the TT-8 owing to its excellent properties soon became very popular. Towards those customers matching our motto "We consider having concluded business with a customer not until we have realized a second sale to him" we wish to show our special appreciation by joining them to our exclusive group GREMO VIP. If you meet the demands specified further down and are not yet a member of the GREMO VIP group of customers, please contact us and we will help you. Are you an owner of a Gremo machine? Then you can get access to our intranet. In our intranet you will find things as software updates for your machine, spare part manuals, etc.